I do love my food. You only have to look at my closet and the bathroom scale know this is true. Recently I've begun playing with fruits to make jams and jellies. The fun part was making a jam just for my mom...she loves her spice (the hotter the better) and so I decided to try to make a hot jelly from mangoes, peaches, and jalapenos. Unfortunately, when I made the jam and sent it to my mother, my nephew got his hands on it first. He liked it, but used the two pints (32 ounces) I sent to my mom for a marinade, barbecued chicken then didn't save any for my mother. Let's just say he pissed me off. So, here's the recipe (and pictures) I used for the first two batches of jam. 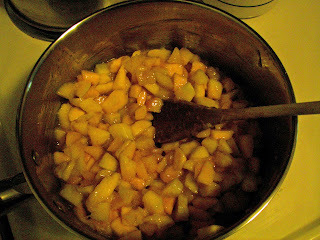 First, peel, pit, and chop mangoes and peaches into small chunks. Using a potato masher, smash the fruit. I left my fruit slightly chunky instead of crushing the fruit completely. Finely chop the peppers and mix into the mangoes and peaches. I kept the seeds from the peppers in the first batch then left them out in the second batch. You can choose which way you'd like to make yours, but the seeds actually make the jam hotter. I prepped the jars by washing them in my dishwasher and leaving them in it on the dry cycle while I prepped the fruit. I also had a large stock pot with water boiling in it for the sealing of the jars. After the fruit and peppers are ready, use a medium saucepan and heat the fruit on medium heat. Bring the fruit to a boil, stirring constantly to keep it from burning or sticking to the bottom of the pan. In a second saucepan, stir the powdered pectin into the water. On medium heat bring the pectin-water mixture to a boil, stirring constantly. Once it comes to a rolling boil, keep it at a boil for two minutes then add the fruit and pepper mixture. Bring the fruit to a rolling boil. Add the Truvia (you can use sugar too, but you usually need about 1/4 of sugar for every tablespoon of Truvia) and stir well. Bring the mixture back to a rolling boil for three minutes, then remove it from the heat, or turn off the burner. Ladle the fruit into the cleaned jars leaving about half an inch away of head room. Put the lid on and tighten to finger tightness and place into the boiling water, making sure to have an inch or two over the top of the jar. Boil for five to ten minutes (use the chart you can find on the back of the powdered pectin container to determine the length of time necessary). Remove from the water and set on counter to cool, listening for the "pop" when the lid seals. Let the jam cool overnight either on the counter or in the refrigerator. It should set or thicken within eight to twelve hours. If it stays slushy or watery looking, you may have to reboil it with a bit more water and pectin. But I haven't had a problem with the jams not setting as long as I brought the pectin-water mixture to a boil for two minutes then after adding the fruit and pepper mixture I made sure I brought it to a boil for three minutes after I added the sweetener. In the second batch, I added 3 Tbs of cinnamon and 1 tsp cayenne to the mixture while the fruit was boiling the first time before I added it to the pectin-water mix. Today, I'm going to be using Serrano peppers instead of jalapenos and more cayenne (and I'm keeping the seeds in for more heat for mom). I'll take pictures of each of the steps and post it in two weeks. The last time I made jam was back in the 70's lol. This sounds really good though. I like it hot too. thanks, Becki. I tried making jam for the first time last year and it wouldn't set. This year I tried a different method and every jar set just fine. I used jalapenos in the first batch but the Serranos I picked up at the store the other day listed a higher BTU (I think that's the heat rating) than jalapenos and I know my mom likes it hot. According to my nephew and my friends in Pittsburgh who got smaller samples of the same jams, it was very nice. I didn't try the jalapeno jam...not my cup of tea, but I did make a mango-peach-nectarine jam that was delicious. Sounds yummy and you're tempting me while I'm trying to lose weight. Can't believe your nephew. How dare he? Oh, wow, that sounds delicious! Love the detailed instructions and pictures. I've never made jam before, but I feel like I could make this! I'm making more today and using my new camera for each of the steps. I love step by step guides...I used them all the time for my students and since I'm a visual learner, the pictures really help me. Good luck if you try the jam. Yum! My hubby loves mangoes. I love mangoes too. And I have to force myself not to eat them before I make the jam. I made other jams with the mangoes too. Mango-peach-nectarine, mango-peach, and strawberry-mango jams all came out very good. I love your idea of alternating interesting recipes with intriguing subjects like the tarot. Both fascinate me. I always come back totally enthused whenever I visit any place or person with an interesting skill (or even a new restaurant) so I'll be hopping by regularly. Mangoes and peaches (nectarines even better!) with a hint of chilli - sounds divine. (I'm just not sure I have the patience for this one, though). I like sharing recipes and other interests that I have, including writing, reading, sewing, crocheting, cooking, and jewelry making. I look forward to your visits. You're going to have to share that recipe, my mom would love it. I finished the mango-peach-Serrano peppers jam this afternoon, and I burned my tongue with just a little bit. I'll have the recipe up on August 24th. Peaches are in season here. Must hit the farmer's market. Yum, lucky you. I blinked and the peaches were in and out of season. Totally sucked.